When I travel to DR Congo, I generally end up visiting farms—rice, peanut, corn, palm, coffee, tea, various fruit trees, and the list could go on. I’m always impressed by the amount of work that Congolese farmers are able to do with such limited resources, and usually with no safety net or insurance. Each time my Congolese hosts offer me a meal, I think about the fields I’ve seen, the people laboring in them, and the many risks associated with farming in Congo. Recently, some of our Congolese partners got to visit a very different kind of farm. Rev. 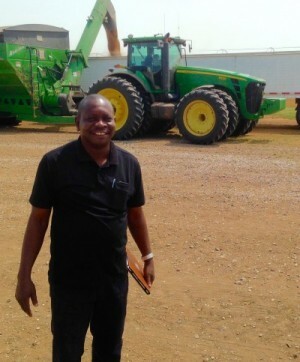 Jules Mboka, President of the Covenant Church of Congo, and his wife Charlotte, together with a group of Americans, visited the family farm of Joe and Geena Kejr in Brookville, Kansas. The Kejrs were in the middle of their wheat harvest when we pulled up, and various family members were operating combines, tractors, and trucks. We were greeted by a friendly dog then immediately summoned to jump in a combine. Over the next few hours, we watched wheat move with overwhelming efficiency from field, to tractor, to truck, and off to a nearby grain elevator. Back at the Kejr farm, we were treated to homemade ice cream while President Mboka shared with the group about farming in DR Congo. In DR Congo, most people work their fields with hoes and machetes then plant and harvest by hand. Some people use fertilizers and insecticides, but this isn’t common practice. Family farms range in size from a quarter acre to a few acres. In Kansas, we learned, farmers often work over 5,000 acres of a single crop. Farm equipment is operated largely by computers and being a farmer is as much about being a tech-savvy chemist and mechanic as it is about dirt and crops. The sort of farming we saw in Kansas isn’t likely to work in Congo, nor should it, but there is great potential for these sorts of exchanges. The differences are huge, but there is so much common ground to learn and grow from together. Farming is ultimately about caring for the land, and the degree to which we care for the land is often reciprocated in what we garnish from it. Kejr Farms’ slogan is “Caring for the Land.” To do this well, Congolese farmers need access to training and, especially in early phases, support. Our prayer is that, as we continue to support local agricultural initiatives in DR Congo, these things will improve production, decrease risk, and catalyze economic progress. President Mboka has invited us to help him and his people as they lead their communities towards better agricultural practices. To do this, we position ourselves as learners, find common ground, and work together to care for the land and the people who depend on it.